The movie started out kind of predictable and a little cheesy but somewhere along the way it got really funny and entertaining. 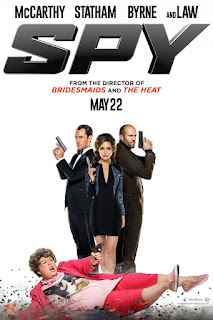 The best part about the movie are the characters, some really authentic and funny characters like; Rick Ford (Jason Statham) the clumsy spy, Raina (Rose Byme) the spoiled brat, Nancy (Miranda Hart) the best friend, Elaine Crocker (Allison Janney) the mean boss and Aldo (Peter Serafinowicz) Pepé Le Pew personified make this movie irresistibly funny. As for Melissa McCarthy, she was ok, I mean I liked mean McCarthy but it was just so much of a character switch that it was weird, it was like she had multiple personality (like Jim Carrey in Me, Myself and Irene).